Boston—home of patriotism, almighty national sports teams, top tier schools, autumnal bliss, world famous athletic competitions, foul-mouthed locals, great historical leaders, eminent inventions and…New England clam chowder, or chowda as the locals call it. One of America’s great culinary traditions that hasn’t spread much elsewhere, Bostonians are prideful and touchy when it comes to their clam chowder, and are easily heated when talking about the tomato-based nemesis, Manhattan clam chowder, from further south. Smooth, creamy and strewn with potatoes and clams, chowder, or chaudière meaning “pot” in French, is a staple in the northeast and is typically served with octagonal oyster crackers and a bit of pepper or hot sauce. 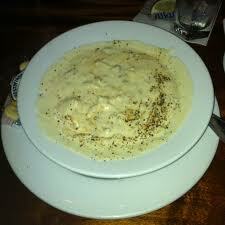 And in Boston, they eat their chowda whether there is snow on the ground or sweat trickling down their backs. You can find New England clam chowder everywhere here, with each restaurant claiming to serve “Boston’s Best” and competing yearly for the title in various cook-offs. So if you are limited to one mollusk-infused bowl—as most of us are—where do you go? How do you begin navigating the internet, guidebooks, magazine recommendations, and counsel from friendly natives? Yes, this is a problem. Luckily I am graciously volunteering myself to remedy your quandary. After scouring Zagat, Yelp, TripAdvisor, Boston Magazine, USA Today, and Boston Herald, I have compiled a list of the most famous and awarded locales, narrowing it to six spots worthy of an in-person taste-test: Atlantic Fish Company, Legal Sea Foods, Union Oyster House, Neptune Oyster, Ned Devine’s and Mr. Dooley’s. Reviews are based on a five-star scale for chowder taste, quality, traditionalism, price, and dining experience. At $7 for a good sized bowl of chowder chock full of fresh clams along with delicious buttery herbed bread and muffins, Atlantic Fish Company is an excellent spot to get your chowder at both lunch and dinner. Centrally located in the heart of Back Bay with classy New England charm, the restaurant provides great service and solid seafood. Nonetheless, the chowder is not the most memorable—a dose of sherry would have kicked it up a notch. With the most impressive flavor profile of all my samples, Neptune Oyster’s clam chowder is more of a cream of clam soup than a traditional chowder. Settled on the bottom are lots of cooked clams, potatoes and other bits of vegetables, but the soup is thin and not very filling—do not expect a meal for your $11. Nestled in the North End, the restaurant was packed, even for lunch, and I recommend preparing for a wait as everyone is Boston seems to want to eat here. Most likely owning to the food’s freshness and the chaotic and cozy atmosphere (i.e. 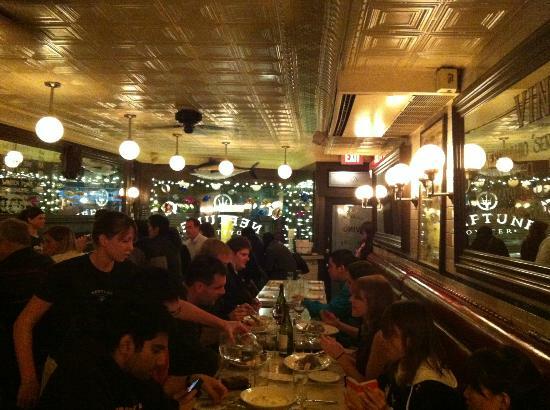 cramped), the restaurant has a huge cult following. A Boston-based seafood restaurant group, Legal Sea Foods is the most mainstream of the bunch providing reasonable food and prices, but without any of the New England charm. I ate at the Legal inside the DoubleTree hotel neighboring our campus downtown, and it seems that the same food quality and prompt service can be found all over the city, as I had nearly the same experience at their Kendall Square and aquarium locations. The chowder is very creamy, with a decent serving of clams for $7 a bowl; however, I may have taken it a bit too far with hot sauce and oyster crackers while distracted by the boisterous tourists next to me. There is no escaping that Legal is a large chain as noted by their formulaic approach to dining. 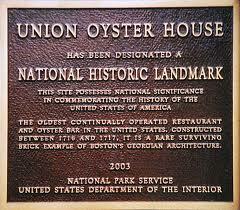 America’s oldest restaurant, Ye Old Union Oyster House is right next to Faneuil Hall and provides a great stop while walking the Freedom Trail with visitors who will get a kick out of the historic interior. For $8, I got a nicely sized bowl of thick, creamy chowder with a large portion of cornbread (which worked well broken up in the chowder). The chowder has enough clams, but reminded me a bit of Progresso’s version, as it seemed to be thickened with flour and did not have a strong flavor. Inside Faneuil Hall Marketplace you can find an array of grab and go chowder spots, but walking to the end of the hall may be worth the extra steps for comfortable seating, a relaxed atmosphere, and buttery, chowder with perfect consistency for the same price as the food hall vendors. For $7, Ned Devine’s serves creamy chowder with bits of fresh thyme, and sweet chopped cockles and clams—a reliable example of the New England staple. I enjoyed the dark wood interior and respite from the touristy chaos, but found myself having to add a bit of pepper. With each tasting, I was waiting for a hint or whiff of porky smokiness, and finally at Mr. Dooley’s, in the heart of the financial district, I was treated to an actual chunk of bacon! The Canadian bacon pumped up the large chunks of clams and potatoes, and along with the warm Irish brown bread, I was left with a full stomach for $7 (the $3 beer helped). 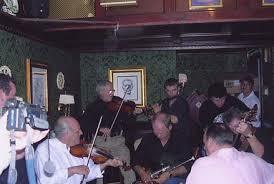 I thoroughly enjoyed both the chowder and live music in this authentically Irish pub. I suggest going for traditional Irish food like shepherd’s pie or beef stew to experience what Mr. Dooley’s does best; however, the chowder will not disappoint. So, who does New England clam chowda the best? That depends on the price you are willing to pay, the ambience you most enjoy, the flavor you are expecting (bacon, herbs, sherry, straight cream), the New England authenticity and the fresh quality you’re looking for. I will continue my search of the city’s perfect bowl during my time at Friedman. My restaurant visits have made me hopeful that I will find it, if only they could add a bit more sherry or bacon! Good luck on your own pursuit—stay strong and carry on. Your bowl is out there. Amy is a first year AFE student and loves high quality free bread.